Dr. Charles Whitworth grew up in Madison, Alabama, right down from the street where Whitworth Animal Clinic is now located. From a very early age, Dr. Whitworth developed a passion for animals and wanting to help them. From the time he was in third grade, Dr. Whitworth knew he wanted to be a veterinarian. Dr. Whitworth went on to graduate from Auburn University’s College of Veterinary Medicine. He is a member of the American Veterinary Medical Association, the Alabama Veterinary Medical Association, and the Madison County Veterinary Medical Association. Dr. Charles Whitworth has served as a Madison veterinarian for over 30 years and is well known throughout the community. 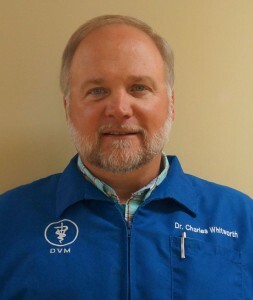 Outside of being one of the foremost Madison veterinarians in north Alabama, Dr. Whitworth enjoys spending time with his wife, Sherry, as well as their six children and 5 grandchildren who live throughout the Southeast. Sherry and Charles love spending time with family, friends and grandchildren. Their oldest daughter, Allison, lives with her husband in Atlanta, Georgia, and has two sons named Cooper and Landon. Continuing the family tradition of working with animals and following in the footsteps of his father, Dr. Chase Whitworth graduated from Auburn University College of Veterinary Medicine in 2008. He is now the owner of Patton Chapel Animal Clinic in Hoover, Alabama. Chase’s wife Lindsay is an attorney with a law firm in Birmingham. They have 2 children, Sutton and Maren. Dr. Whitworth’s middle two sons, Mark and Chad, also graduated from Auburn University. Mark is a project superintendent for Rachel Brown Homes in Madison. Chad is also a project superintendent for DSLD Homes in Madison and his wife, Kelley is a dental hygienist for Madison Dental Care. They have one son, Miller. Dr. Whitworth’s youngest daughter Taylor graduated from Auburn University in 2017 and now works at Dermatology Solutions Group LLC as a physician’s assistant. Finally, Dr. Whitworth’s youngest son, Hunter, attends Auburn University. Dr. Whitworth has many loyal patrons throughout the Madison, Huntsville, and Decatur areas. If you want top-notch veterinary care, call Whitworth Pet Vet today. Whether your pet needs dermatological care or a heart check up, you need to meet the folks at Whitwoth Animal Clinic.